When Grover Cleveland took the Presidential Oath of Office in 1885, he was appalled to find that his rotund predecessor, the all but forgotten Chester A. Arthur, had transformed White House dining into an endless gastronomic banquet. The new meat-and-potatoes President Cleveland was driven to despair at the sight of all those slippery oysters on his mac-n-cheese and thought he’d never again enjoy a good meal. Then one night, appalled at the French cuisine that was being served, yet again, the President smelled an intoxicating aroma coming from the servant’s quarters. Finding his servants dining on corned beef and cabbage, the President requested they swap their food for his. And once he’d tasted their lowly boiled corned beef and cabbage, the world leader declared that he’d finally found food fit for the Gods. This week all across America, as we celebrate St. Patrick’s Day, families will sit down to this same meal of unceremoniously boiled meat and vegetables that had brought such joy to the nineteenth century President. But curiously, the boiled dinner of corned beef (or less commonly, ham) and cabbage and root vegetables which is famed as a traditional Irish meal, is anything but a traditional Irish meal. But that’s one of the curious things about tradition – it changes continually, modifying to adapt to new conditions, new sentiments, and new ideas. In fact, there aren’t many “traditional” foods anywhere that didn’t originate sometime in the historical records, vary across regions and among families, and change many times. And that’s what makes our traditions so much fun – they are ours for the making. And that is precisely how “boiled dinner” or corned beef and cabbage came to be the “traditional” St. Patrick’s Day meal. It was a meal modified to invoke memories of Irish cuisine, but suited to the New England and Newfoundland regions where Irish had settled following the potato famine during the nineteenth century. Yet even potatoes, as “traditionally” Irish as the shamrock, were an agricultural innovation of the 17th century. When the British appropriated Irish lands to graze beef for export, the Irish were forced to grow their food on more marginal lands. In order to maximize caloric production on minimal land holdings, they began growing potatoes, which soon replaced porridge as the dietary staple of Irish commoners and to this day remains a central part of the Irish diet. The beef that grazed on Irish lands remained too expensive for most Irish households to afford. But curing meats with salt had proven to be such an effective method of preserving meat, that it was an excellent source of protein for transport to supply the British Navy (which is why corned beef used to be stamped “Cured Naval Beef”) or to the British colonies to feed slave labor in the Caribbean. The common story is that the term “corned” beef came about because the coarse salt used in curing was the size of a kernel of corn. But the word “corn” itself derived from the Old English word “corn” referring to any grain with the seed still in it. “Corning” was a curing process involving salt the size of grains, a term applied to meat as early as the mid 16th century, whereas the modern English use of the word corn to apply to corn on the cob did not become common usage until the 17th century, when it was used in the American colonies to apply to “Indian” corn. How then, did corned beef and cabbage come to be a “traditional” Irish meal if it was not consumed by the Irish? Because pigs were common in Ireland, smoked and salted pork in the form of bacon or ham was a common source of meat protein, leading to the popularity of the ordinary peasant meal of boiled bacon back served with potatoes (often mashed) in white sauce. When the 19th century Irish potato famine led to a mass emigration from Ireland to North America, Irish immigrants in New England and New Foundland longed for their familiar foods. But bacon back (very different from the slabs or slices of bacon in stores today) was not as common, and salt-cured “corned” beef was. Immigrant women found that boiling the locally-available “corned” beef with local vegetables, produced a meal very similar to the boiled bacon back and mashed potatoes of their homeland, even if the rich white sauce had become too expensive for most immigrant households in America and had to be abandoned. In other words, the relocated Irish relied on available foods, new or differing curing and cooking technologies, and their economic means, to transform a cultural memory into a new “traditional” feast consistent with the foods they’d had in Ireland, but not the same. And that’s how traditions are born. Yet the history of boiling meat and potatoes extends far past the immigration of the Irish to North America. Meals of boiled meat (or fish) and carbohydrates are common throughout the world, where cooking fuel – and cooking utensils – are scarce and both must be used efficiently. With hundreds of millions of homes – mostly in the developing world – depending on wood fuel as their primary source of energy, boiled dinners may well be the most common meals humans cook. By placing a kettle of meat (or beans) on the fire to cook through the day, a tough cut of meat (when available) or dried bean becomes tender and produces rich stock that is filling and nutritious. These peasant meals become more complex as they make their way to urban settings, where seasoning and other ingredients are added to create new classic dishes. Whether the French pot au feu, the Italian bollito misto or Vietnamese pho, “boiled dinner” is a “traditional” feast across the globe. And the key to a good boiled dinner? Just like remembering that the last thing a microwave oven can do is bake, always remember that a good boiled dinner must never boil – it simmers (though I have tried baking it to excellent and horrid results – excellent was produced from rinsing the corned beef very well and baking it in loads of water, horrid was the result of using very little water and roasting the beef to tender – but sickeningly salty—perfection). Finally, there is no reason you can’t innovate with your own boiled dinner recipe. 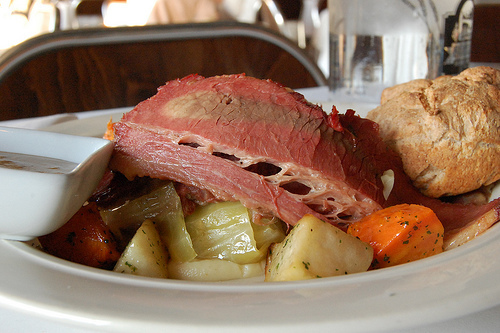 While contemporary corned beef and cabbage includes an assortment of root vegetables (potatoes, rutabagas, carrots, turnips, parsnips – whatever is on hand), there is no reason you can’t omit the turnips if you don’t like them, or add onions if you do (now very common to most boiled dinner recipes, but among some purists adding an onion to boiled dinner is as shocking as boiling a baseball). My own innovation? Years ago I realized that while boiled dinner is one of my all time favorite dinners, and probably the dinner I’d order if I ever found myself on death row and had to choose a last supper, I really don’t care much for a wedge of boiled cabbage no matter how it’s presented. So I have modified my “traditional” boiled dinner to include not just a maverick onion or two, but sautéed shredded cabbage cooked in a rich sauce of chicken stock, Dijon mustard, and bacon fat and seasoned liberally with caraway seeds. Serve with simmered corned beef, root vegetables cooked in the rich meat stock, some fresh horseradish mixed with sour cream, and mugs of Guinness stout and you’ve got a “traditional” Irish meal fit for a leprechaun.